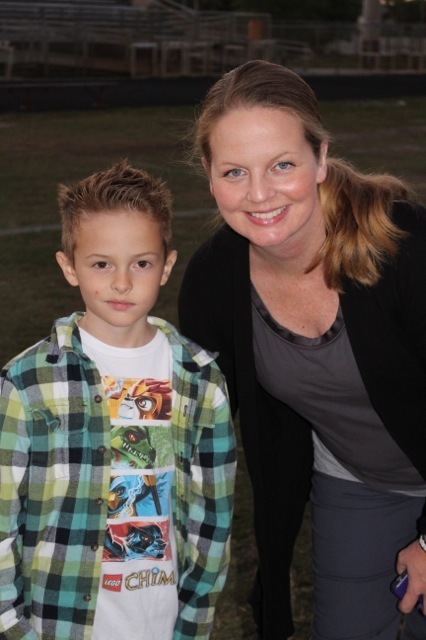 Mama & Her Date – Jacob (7) – the Cool Kid! I was recently reminded that some milestones are downright painful to reach, even for your third and fourth children. Jonah has for the past eight weeks, since birth been within arms reach of me. I have responded to his cries, read his cues of hunger and been the only person to feed him. But… I knew from experience, that at some point I would have to relinquish a little bit of control. I would have to separate from my baby, even for just a few hours. We were notified of the exact time and date of our first separation via a memo that Jacob brought home from school. “Mother Son Movie Night”, an annual event at his school – the boys’ equivalent of the “Father Daughter Dance” was scheduled for Saturday in early March. We were invited to this special event two weeks in advance. I had two weeks to plan, fret, dread, worry and stall – yup – all of these emotions took place! I went through each and everyone of them! I tried to convince my husband that I should bring the baby along. He made a compelling argument as to why this evening should just be about Jacob and Mama. I knew he was right, but Jacob is so sensible I was sure I would be able to sell him on my plan. But then I remembered that I am the rational adult, and that Jacob did deserve a night away from ALL of his brothers. Well, in true mommy-form, I started to prepare for our first separation over a week ahead of time… I broke out the breast pump. Boiled and assembled all the newly replaced parts and added pumping sessions to our daily feeding routine. It struck me how even a few hours away from my baby required such advance planning. “Spur of the moment” and “on a whim” are just not part of my vocabulary these days, unless Jonah is included in the plans. Saturday came. The event was outdoors and the weather forecast did not include rain – I had secretly hoped for a severe thunderstorm, even a slight drizzle would have been nice. Jacob was still excited about our date night, all 54 times that I asked him – just to make sure that he REALLY wanted to go! I felt so torn, welcome to motherhood, Tove! Prepare to become a master at juggling and emotionally compromising once you become a mother – there is only one you, and generally several humans or engagements that require your presence or at least your attention at any one time. So – being the “mama in the now” that I am… funny how I had to remind myself to practice what I preach, I realized that this event meant far more to Jacob than a few hours apart from mama meant to Jonah. I told myself that Jonah would NOT need therapy because his mom left him with dada for a maximum of three hours as an infant. However, Jacob would certainly remember, and possibly hold a grudge if we did not attend “Mother Son Movie Night” because I was too much of a chicken and a mother hen. Jonah would be OK, he would not be scarred for life if he had to miss me a little – so off we went. Jacob met up with several of his class mates, and as luck would have it, his friend’s mother was also a nursing mom – so she felt my pain. Literally – we were both starting to get engorged towards the end of the movie, so we truly shared each others pain. But beside from full breasts and slightly chilly temperatures it was really a great opportunity to spend quality time with Jacob. We had both seen the movie they showed several times. But the evening was less about the cinematic experience, and all about giving our kids the love and attention they need and deserve. Jonah was happy to see me, or rather he was thrilled to nurse when I got home. Jordan, my little reporter at the scene informed me that baby Jonah cried and missed mama. Although the separation from my baby was hard, the bonding with my oldest son made it worthwhile. Each of the kids deserve their own special time in the limelight with mama or dada. We will definitely make an effort to schedule these “one on one” dates with the boys on a regular basis – as much for them as for us. I am thankful for “living in the now”, since it made me realize how important the event was for Jacob – and I allowed myself the opportunity to focus on him and enjoy our time together. Jacob didn’t just need me physically present at the movie night – he deserved that I was mentally present as well – and I was!